^ B. Hoffman, "Inside Terrorism", Columbia University Press, 1999, p. 105–120. ^ Ian Gilmour, Andrew Gilmour. Terrorism review. Journal of Palestine Studies (University of California Press). 1988, 17 (2): 136. doi:10.1525/jps.1988.17.3.00p0024k. ^ Peter Steinfels. A Day to Think About a Case of Faith-Based Terrorism. New York Times. 2005-11-05. ^ Taming the Spirit Wrestlers. Time Magazine. 1966-02-11. ^ The MIPT terrorism annual 2004 (PDF). National Memorial Institute for the Prevention of Terrorism. 2004. （原始内容 (PDF)存档于2009-03-05）. ^ Constitution of National Liberation Front Of Tripura. South Asia Terrorism Portal. ^ National Liberation Front of Tripura, India. South Asia Terrorism Portal. ^ Claire Mitchell. Religion, Identity and Politics in Northern Ireland. Ashgate Publishing, Ltd. 2006: 51. ISBN 0754641554. ^ Paul Tinichigiu. Sami Fiul (interview). The Central Europe Center for Research and Documentation. 2004-01. （原始内容存档于2013-12-02）. ^ Radu Ioanid. The Sacralised Politics of the Romanian Iron Guard. Totalitarian Movements and Political Religions. 2004, 5 (3): 419–453(35). doi:10.1080/1469076042000312203. ^ Roots of Romanian Antisemitism: The League of National Christian Defense and Iron Guard Antisemitism (PDF). Background and precursors to the Holocaust (Yad Vashem – The Holocaust Martyrs' and Heroes' Remembrance Authority). ^ 14.0 14.1 Alexander Verkhovsky. Ultra-nationalists in Russia at the beginning of the year 2000. Institute of Governmental Affairs (University of California, Davis). ^ UCSJ Action Alert. Union of councils for Jews in the Former Soviet Union. [2010-05-16]. （原始内容存档于2008-12-28）. ^ Bases of the social conception of Russian National Unity (RNU). Russian National Unity. ^ Xan Rice. Background: the Lord's Resistance Army. The Guardian. 2007-10-20. ^ 18.0 18.1 Ruddy Doom and Koen Vlassenroot. Kony's message: A new Koine? The Lord's Resistance Army in northern Uganda. African Affairs (Oxford Journals / Royal African Society). 1999, 98 (390): 5–36. ^ Ugandan rebels raid Sudanese villages. BBC News. 2002-04-08 [2010-01-02]. ^ K. Ward. The Armies of the Lord: Christianity, Rebels and the State in Northern Uganda, 1986–1999. Journal of Religion in Africa. 2001, 31(2). ^ Marc Lacey. Uganda's Terror Crackdown Multiplies the Suffering. New York Times. 2002-08-04. ^ David Blair. I killed so many I lost count, says boy, 11. The Telegraph. 2005-08-03. ^ Matthew Green. Africa’s Most Wanted. Financial Times. 2008-02-08. ^ Christina Lamb. The Wizard of the Nile: The Hunt for Africa’s Most Wanted by Matthew Green. London: The Times. 2008-03-02. ^ Marc Lacey. Atrocity Victims in Uganda Choose to Forgive. New York Times. 2005-04-18. ^ Patrick Q. Mason. Sinners in the Hands of an Angry Mob: Violence against Religious Outsiders in the U.S. South, 1865–1910 (PDF). University of Notre Dame. 2005-07-06. ^ Frederick Clarkson. Kopp Lays Groundwork to Justify Murdering Abortion Provider Slepian. National Organization for Women. 2002-12-02. （原始内容存档于2009-08-21）. ^ Laurie Goodstein and Pierre Thomas. Clinic Killings Follow Years of Antiabortion Violence. Washington Post. 1995-01-17. ^ 'Army Of God' Anthrax Threats. CBS News. 2001-11-09. ^ Bruce Hoffman. Inside Terrorism. Columbia University Press. 1998. ISBN 0231114680. ^ Eric Rudolph charged in Centennial Olympic Park bombing, FBI release, October 14, 1998. ^ Eric Robert Rudolph: Loner and survivalist. CNN. 2003-12-11 [2006-11-26]. Rudolph and his family were connected with the Christian Identity movement, a militant, racist and anti-Semitic organization that believes whites are God's chosen people. ^ Apocalyptic Christians detained in Israel for alleged violence plot. CNN. 1999-01-03. ^ Cult members deported from Israel. BBC News. 1999-01-09 [2010-01-02]. ^ George Tiller's killer has no regrets, doesn't ask for forgiveness. Houston Belief. 1999-02-09 [2010-02-28]. 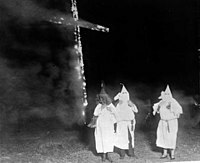 ^ "US 'Christian militants' charged after FBI raids " BBC, March 30, 2010. Retrieved March 30, 2010. ^ Mark S. Hamm. In Bad Company: America's Terrorist Underground. Northeastern. 2001. ISBN 1555534929. ^ James Alfred Aho. The Politics of Righteousness: Idaho Christian Patriotism. University of Washington Press. 1995: 86. ISBN 029597494X. ^ Alan Cooperman. Is Terrorism Tied To Christian Sect?. Washington Post. 2003-06-02. ^ Martin Schönteich and Henri Boshoff. 'Volk' Faith and Fatherland: The Security Threat Posed by the White Right. Pretoria, South Africa, Institute for Security Studies. 2003. ISBN 1919913300. （原始内容存档于2006-04-11）. Zeskind, Leonard. 1987. The ‘Christian Identity’ Movement, [booklet]. Atlanta, Georgia: Center for Democratic Renewal/Division of Church and Society, National Council of Churches.